Summit the world's tallest peak from the North Side - without the crowds or the risk of the South Side and Khumbu Icefall. 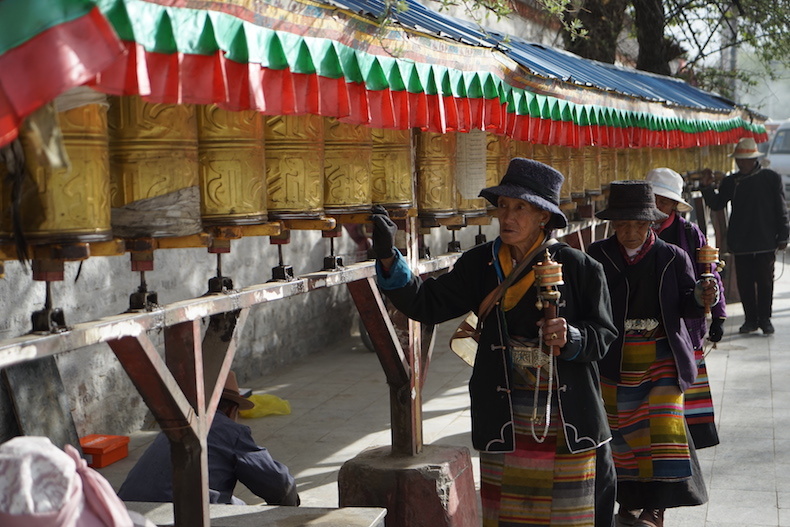 Experience the unique culture, environment, and people of Tibet. Climb Everest in half of the time of traditional expeditions, with the North Side's most professional team and best logistics. Alpenglow Expeditions’ Rapid-Ascent climbs are an entirely new way to approach big-mountain expeditions. 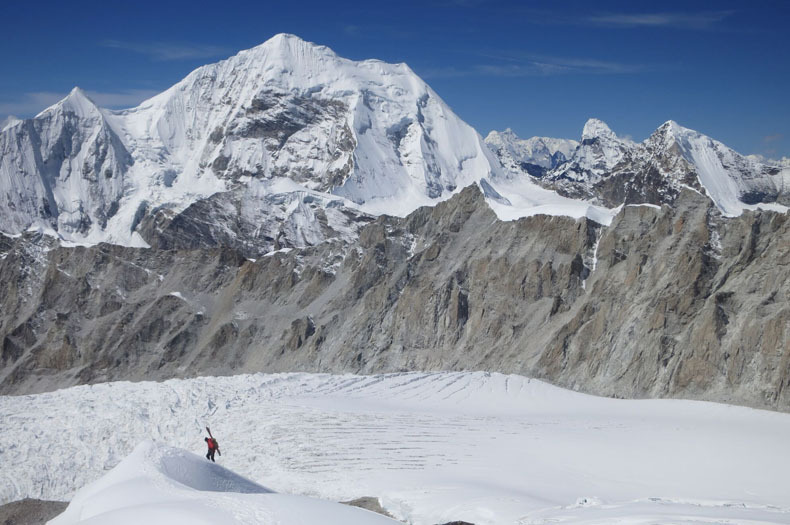 After 15 years of guiding expeditions all over the world, including more than a dozen 8,000-meter peak expeditions, we have refined and distilled the acclimatization and climbing process to maximize safety, health, success, and enjoyment. Please contact us to discuss exactly what these shorter climbs entail. Mt. Everest, the tallest mountain in the world (29,035 feet/8,850 meters), is an incredible challenge and experience. Alpenglow’s unique format and extensive experience gives us the ability to achieve the highest levels of both safety and success. Since 2015, we have moved our operations to the North Side of Mt. Everest. With increasing stability in Tibet being contrasted by increasing instability in Nepal, the significantly safer and less crowded route from the North Side is an obvious choice for our teams. Our team’s strengths cater well to the increased remoteness of the North Side. Our Sherpa, guides, and support staff are unanimous that responsible climbing teams must avoid the increasingly unpredictable icefall and politics found on Everest’s South Side. Many members of our team (including Sherpa, cooks, doctor, and guides) have worked extensively on the North Side and make our team one of the most experienced to offer climbs from Tibet. 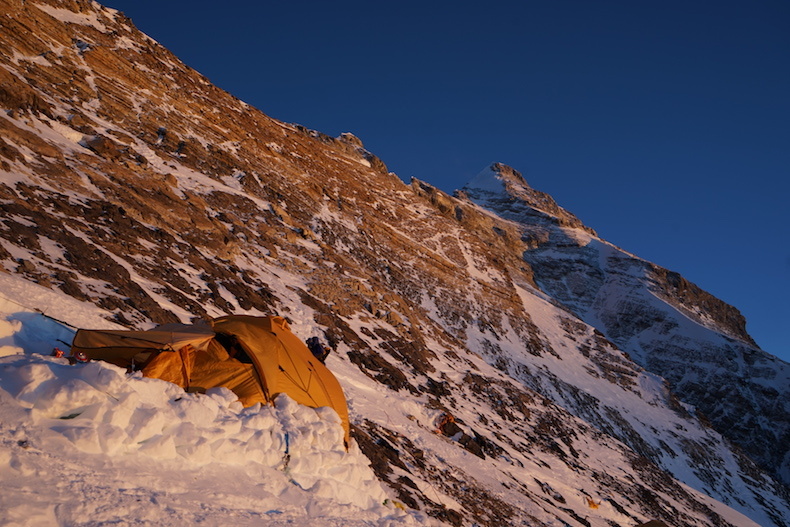 Alpenglow offers an exceptional level of competency, safety, and comfort to Everest expeditions. Our team will be limited to 9 members, with certified guides and the best Sherpa and cooks available (staff we have been working with for more than a decade). Our small group size allows us to adapt to changing conditions and weather far more easily than many commercial teams, which have become so large over the last five years that they have become difficult to manage. Our member to Sherpa (2:3) and member to guide ratios (3:1), the comforts of our Base Camp, our fresh and nutritious food, and our use of maximum oxygen are details that add up to a far more enjoyable experience and successful climb. Historically, we have seen that over 30% of climbers on other teams head home long before attempting their summit push on Mt. Everest. This is generally for 3 reasons, all tied to the amount of time teams take “acclimatizing” on the mountain: the multiple trips up and down the mountain during acclimatization cause the climber to reassess the risk and go home, the climber’s weight loss, chronic sickness and progressive weakening at altitude cause them to call off the trip, or a family or work issue at home takes priority. Our goal with a 35-day itinerary is to keep all the necessary acclimatization, training, and mountain preparation, while minimizing the unnecessary waiting and down time of traditional expeditions. 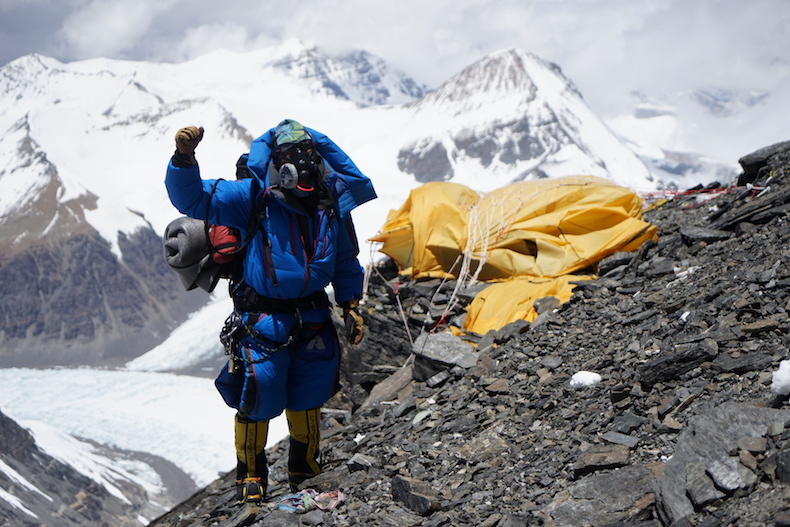 Use of the best technology available (including weather forecasting, efficient oxygen systems, and pre- acclimatization in hypoxic tents) and our team’s experience (and their early arrival and late departure to pre-set and clean the mountain’s camps and ropes), allows our team to minimize their time approaching Advanced Base Camp, while maximizing their chances of success. Alpenglow Expeditions’ logistics, guiding, Base Camp staff, food, and equipment are of the absolute highest level possible. 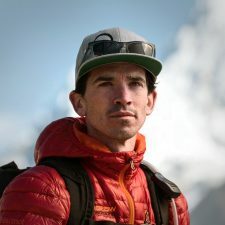 As with all of Alpenglow’s 8,000-meter peak expeditions, Everest is organized and led by IFMGA guide, Adrian Ballinger. Adrian is one of the most recognized guides in the Himalaya, with an impeccable safety record and twelve 8,000 meter peak summits, all while guiding or rope-fixing for guided teams. 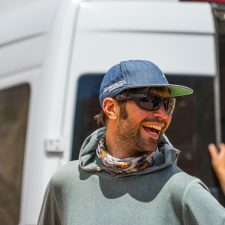 Adrian has extensive experience organizing complicated logistics for large Himalayan teams (including 6 years as lead guide for one of the Himalaya’s largest companies), as well as countless hours on the mountain rope-fixing with Sherpa, guiding members, and assisting and organizing rescues. While many downplay the difficulty and hazards of climbing Mount Everest, Alpenglow maintains a deep respect for the nature of this mountain and you will never find us underestimating its potential dangers. We require a significant amount of experience from each of our members to ensure that you will feel comfortable on the peak, both with your own skills and of those of your teammates. Climbers must have substantial climbing experience to join our Everest Expedition. 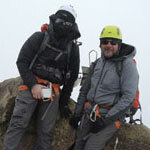 Climbers must have climbed at least one 8,000 meter peak prior to joining us on an open enrollment. Climbers must be able to climb technical terrain with an alpine pack on their back. 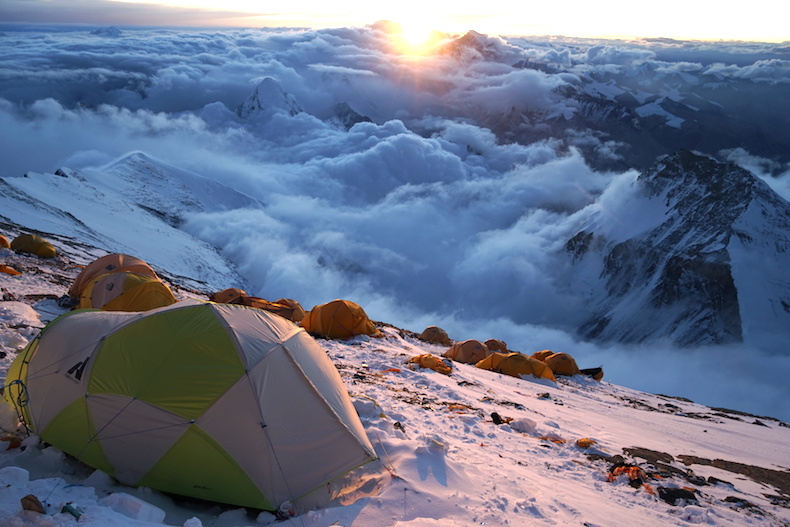 Climbers should also be comfortable with camp craft in high- altitude camps and be able to perform at a high level for multiple days in a row at altitude. Must be able to climb moderate rock, ice, and snow terrain, often with an alpine pack on your back. You should be comfortable with camp craft in high-altitude camps, and able to perform at a high level for multiple days in a row at altitude. Prior ascents of multiple 6000 - 7000 meter peaks is strongly recommended. Climbers fly into Chengdu, China, arriving by the evening. Team members must stay overnight in Chengdu in order to pick up their paperwork that allows travel in Tibet. Alpenglow arranges for these documents to be sent to the hotel of choice. This is considered a travel day and is not part of the Alpenglow program. Fly by plane to Lhasa (12,000 feet/3,650 meters). These flights are usually in the morning, getting climbers to Lhasa mid-day. From the airport it is an hour drive into Lhasa, where we have a bit of time to walk around the old city, and enjoy a traditional Tibetan dinner. 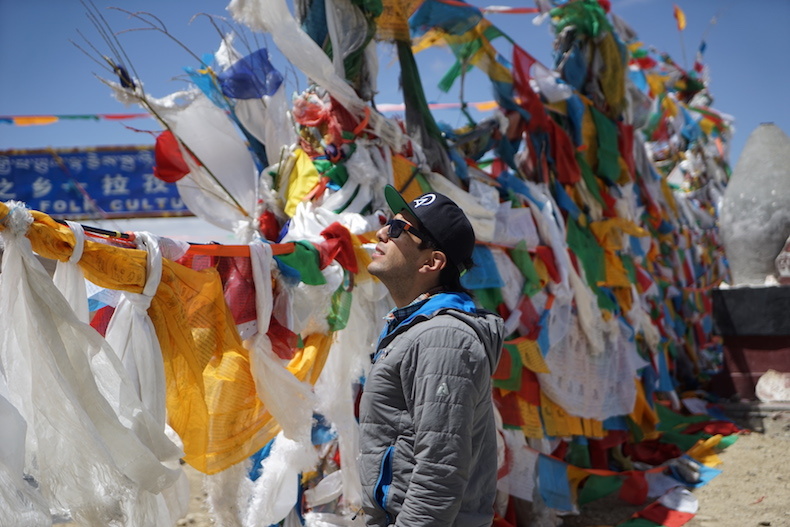 Day 3 — Drive Shigatse to Everest Base Camp (17,000 feet/5,200 meters). We continue along the Tibetan Plateau until we begin to see views of Everest. From there we leave the main road and follow the valley to the Rongbuk Monastery. After exploring the monastery and lunch, we continue driving into our base camp, where we settle in. Day 4 — Rest in Everest Base Camp. Our camp offers excellent food, comfortable tents, and important amenities (heated dining tents, electricity, etc.). We allow our bodies to continue their acclimatization, and spend the day organizing equipment and logistics. Day 5 — Rest in Everest Base Camp. Today we do an acclimatization hike above camp, returning in time for lunch and rest before tomorrow’s move. Our acclimatization day are spent hiking, resting, eating and getting used to life on the mountain. We split the move to Advanced Base Camp in two, today moving 6 miles to Interim Camp. While this camp is simple, we still ensure comfortable sleeping, dining, and excellent food. The location is incredible, surrounded by penitentes (ice towers). Today we move 6 miles to Interim Camp. The location is incredible, surrounded by penitentes (ice towers). 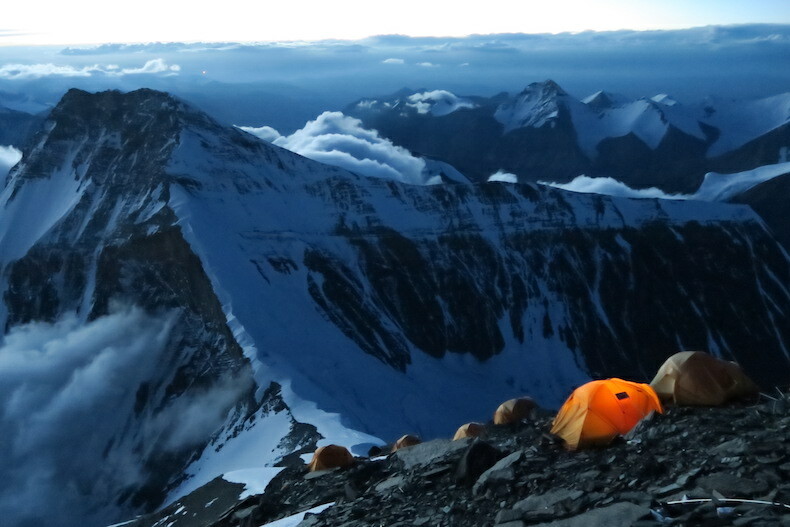 Day 12 — Interim Camp (19,000 feet/5,800 meters) to Advanced Base Camp (21,300 feet/6,400 meters). Six miles of hiking along the moraine and glacier bring us to Advanced Base Camp, our home on the side of the East Rongbuk Glacier. This camp, our main one for the duration of the expedition, is established with as much comfort as possible to balance life in the harsh environment. Day 13-14 — Acclimatize in Advanced Base Camp (21,300 feet/6,400 meters). Our bodies need time to acclimatize to over 21,000 feet. We utilize the days re- visiting required fixed rope and climbing skills, taking short acclimatization hikes, and eating and resting in our impressive camp. Day 15 — Advanced Base Camp (21,300 feet/6,400 meters) to North Col Camp (23,000 feet/7,000 meters). A 4-6 hour climb takes us from the edge of the East Rongbuk Glacier up progressively steepening snow slopes. 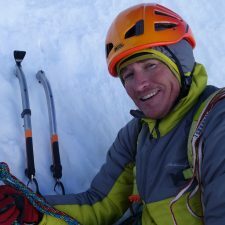 The 2,000 foot climb is an excellent time to focus on crampon efficiency and fixed rope technique, and arriving at the North Col is hard-earned. Day 16 — Rest North Col Camp (23,000 feet/7,000 meters). Again, a day of rest aids our body in acclimatization. Day 17 — Rest North Col Camp (23,000 feet/7,000 meters). We take an acclimatization climb part way along the wide snow ridge towards Camp 2, descending back to North Col Camp for the night. Day 18 — Descend from North Col Camp (23,000 feet/7,000 meters) to Advanced Base Camp (21,300 feet/6,400 meters). We descend quickly via rappels and arm-wrapping back to our camp on the side of the glacier. 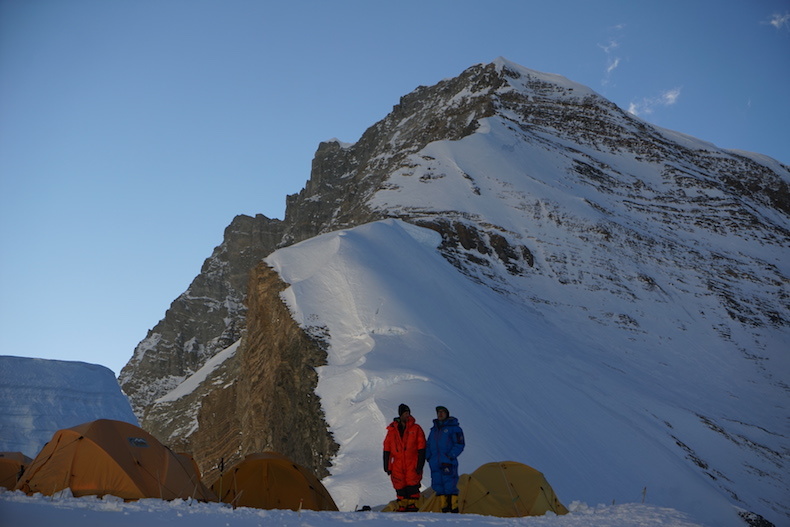 Our bodies will need rest, but now feel strong and able to recover at Advanced Base Camp. At the minimum we take 5 days of rest in BC before considering a summit push. We descend all the way to Base Camp to make the most of our recovery time before our summit push. Day 24-31 — Summit Window. When weather, conditions and health allow, we make our summit push. We return to North Col Camp. From North Col we utilize supplementary oxygen to continue to Camp 2 (24,750 feet/7,500 meters), Camp 3 (25,600 feet/7,900 meters), Camp 4 (27,400 feet/8,300 meters) and on to the summit (29,029 feet/8,848 meters). The climbing above North Col varies, with mostly easy snow and rock ledge walking punctuated by short steeper steps, including the First, Second and Third Steps on the way to the summit. 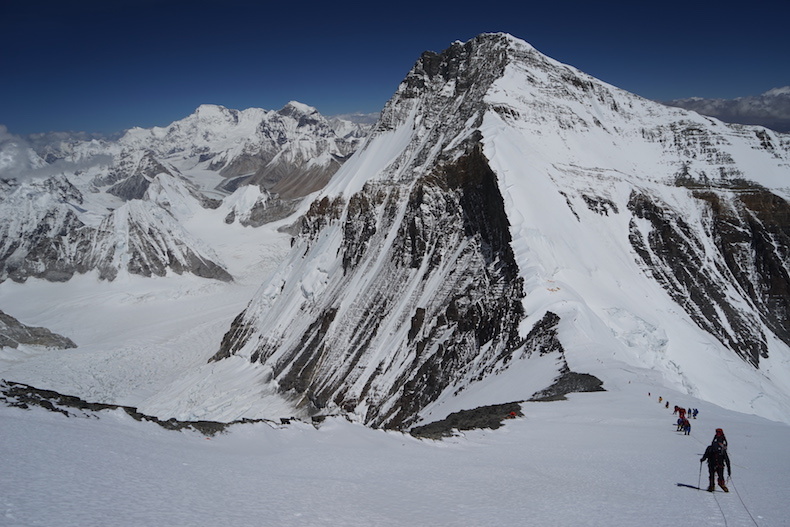 After topping out, we descend as far as possible – North Col Camp or Advanced Base Camp. We say goodbye to our mountain staff and hike the 12 miles back to Everest BC. We celebrate with fine alcohol and delicious food. An expedition we'll never forget. We load our personal gear and selves into jeeps for the ride to the town of Shigatse. A long day of travel takes us across the Tibetan Plateau to our simple but clean hotel in Shigatse. If our travel went smoothly this is a day for souvenir shopping, or palace viewing. Some team members might be able to fly home this evening, the rest of the team will depart the next day. *Please note the above schedule is only one possible scenario. A mountain like Everest requires flexibility, and every year our climb is different. I see that Alpenglow climbs on the North side of the mountain. Why is that? For 2015 and beyond, we have moved our operations to the North Side of Everest. With increasing stability in Tibet being contrasted by increasing instability in Nepal, the significantly safer and less crowded route from the North Side is an obvious choice for our teams. Our team’s strengths cater well to the increased remoteness of the North Side. Our Sherpa, guides, and support staff are unanimous that responsible climbing teams must avoid the increasingly unpredictable icefall and politics found on Everest’s South Side. Many members of our team (including Sherpa, cooks, doctor, and guides) have worked extensively on the North Side and make our team one of the most experienced to offer climbs from Tibet. What sort of experience is needed for Everest? In order to join our Everest expedition, climbers must have experience on an 8000 meter peak. 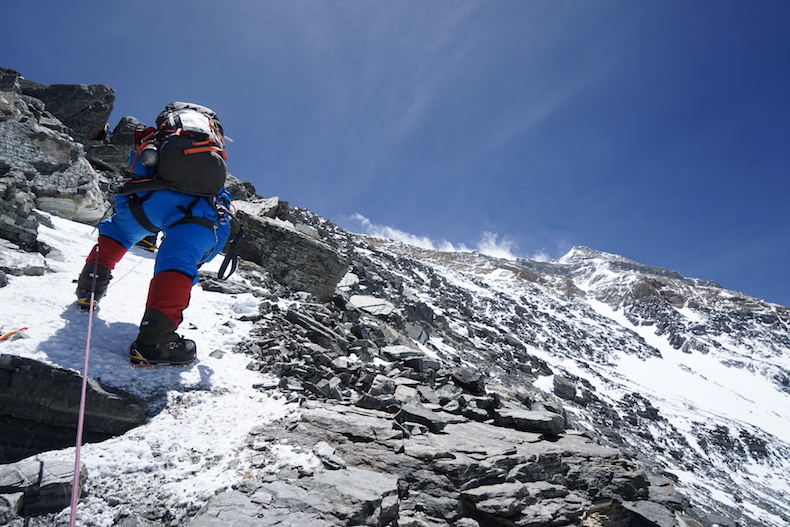 Many climbers gain this experience by joining our expedition to Cho Oyu. Climbers must have solid ice and snow climbing experience, including the use of ice axe, crampons and fixed rope systems. I really want to climb Mt. Everest, but I don’t have a lot of climbing experience. What do you recommend? 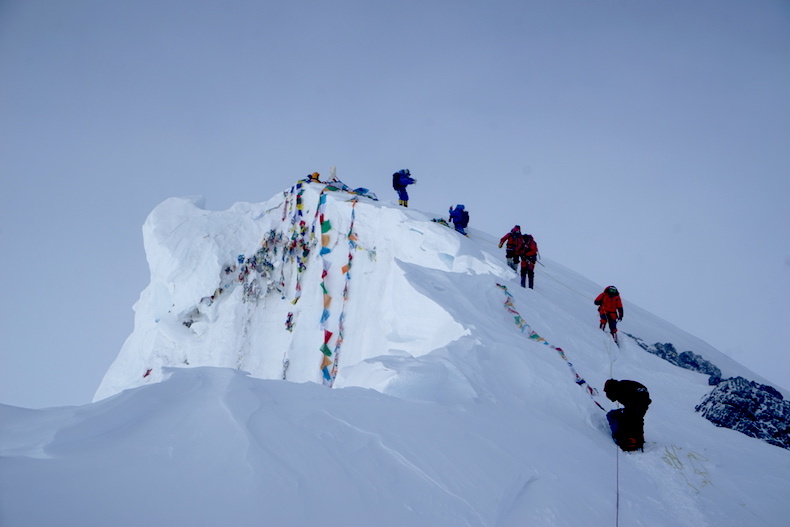 Climbing Everest is a lifelong goal for many people. Often, an ascent of this peak is the crowning achievement of a climber’s high altitude career. Alpenglow Expeditions has very strict requirements to become a team member on one of our Everest expeditions, and it takes time to gain the necessary skills and experience. This is a multi year project for many people, starting with basic climbing instruction at one of our multi day climbing schools. Afterwards, larger and more complex mountains are attempted, culminating in an expedition to an 8000m peak, which is usually Cho Oyu. After all of this, a climber is now ready to be a team member on an attempt to climb Mt. Everest. What is your guide to climber ratio? 1:3 maximum guide to climber ratio. All guides are IFMGA qualified or aspirants working towards finishing their certification. This is the lowest member to guide ratio in the Himalaya. What is your Sherpa to climber ratio? 3:2 Sherpa to climber ratio. Having 3 Sherpa per 2 climbers ensures we have the strength necessary to carry loads, set camps, and assist climbers. 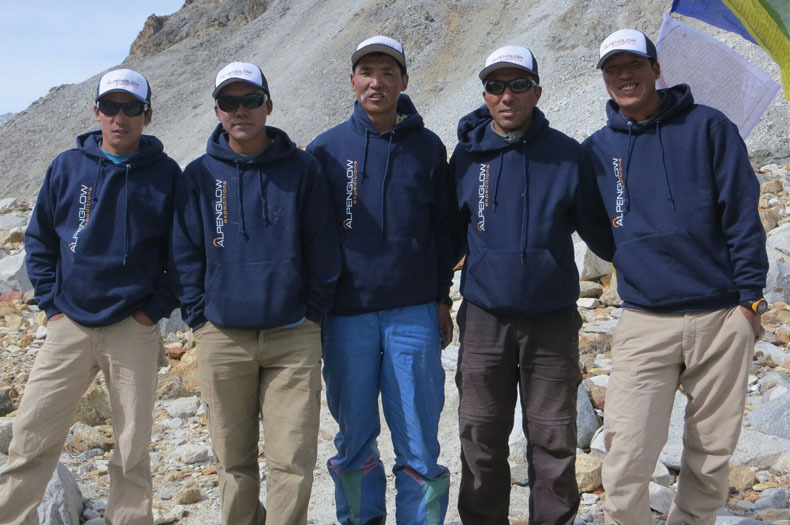 All of our Sherpa on Everest have worked with us on many expeditions. Do you have an Expedition Doctor? 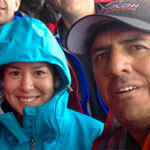 Expedition doctor, Monica Piris, has been on fourteen 8,000-meter peak expeditions. She travels with the group and is in Base Camp throughout the expedition. Dr. Piris also works with each member on his or her pre-acclimatization program. Swiss weather forecasts. 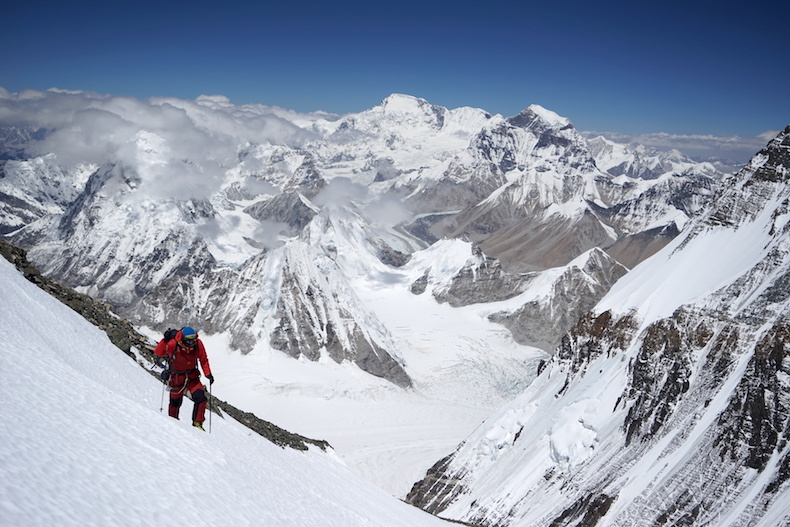 Having a quality forecast for Mount Everest maximizes both our safety and our summit success. How much oxygen per climber do you take? 9 bottles of oxygen per climber. 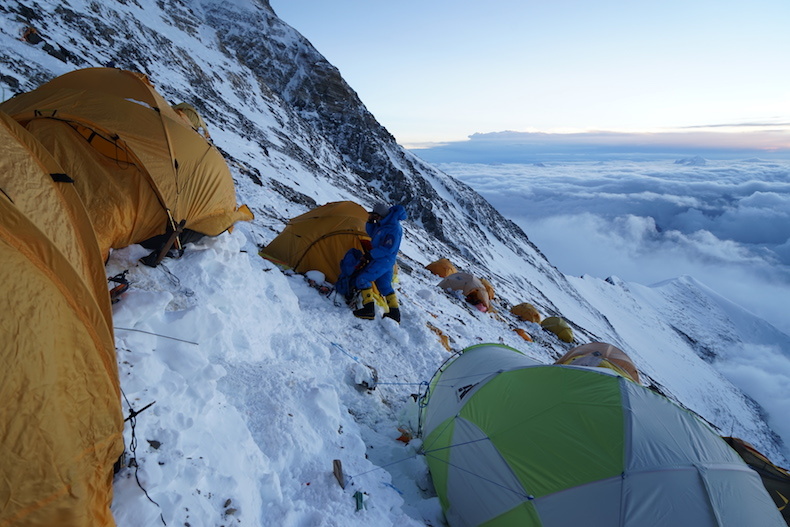 This allows us to use high-flow oxygen sleeping at Camps 2, 3 and 4, and to climb on a higher flow than other expeditions (2L from North Col-C2, and 4L from C2-C3, C3-C4, and C4-Summit-North Col), maximizing safety and success. Our Sherpa also climb and sleep on oxygen, which means they have more strength to focus on you and your ascent. Imported and local foods of the highest quality, combined with a Western-trained cook staff. Alpenglow has the best food on the mountain, ensuring your strength and health throughout the expedition. Unlimited WIFI Internet in Base Camp, Interim Camp, Advanced Base Camp, and North Col Camp. We understand the modern need for technology, and this allows you to stay in touch with home and office via email, text message, and phone at no additional expense. Is the Pre-acclimatization equipment included in the price? Pre-acclimatization using Hypoxico Altitude Training Systems. An eight-week rental is included in the expedition price, and use of the system (or equivalent pre- acclimatization) is a requirement for joining our Rapid Ascent expeditions.